How Can I Encourage My Baby or Toddler to Eat More Vegetables? I think just about every parent wishes her child would eat more vegetables. We found that BabyC became much more selective about what she ate right around 11 months, and there was a noticeable drop in her vegetable intake at that time. When all else fails, put veggies on the floor. BabyC finds food on the floor more trust-worthy and interesting than food on her high chair tray. We all want our kids to eat well today (or at least on average over the week), but we also want them to form healthy eating habits that will last a lifetime. Are there any strategies we can use to get our babies and toddlers to eat more vegetables? Luckily, there is a ton of interesting research on this topic. First, studies show that you are not alone. This probably will not surprise you, but sometimes it helps to know that your child is completely normal. A 2008 survey  of over 1500 babies and toddlers in the U.S. found that, among 9- to 24-month-olds, roughly 30% of them ate NO vegetables on a given day, and this study counted French fries as a vegetable! Only about 10% ate dark green veggies and 15-30% ate yellow veggies on a daily basis. What was the most popular vegetable in this age group? You guessed it – the humble potato. There is a biological explanation for why your child may avoid green vegetables in particular. Roughly 70% of humans worldwide are sensitive to bitter taste. A gene associated with bitter sensitivity has been identified, and a simple standardized taste test can pick out bitter-sensitive kids from a crowd. Given this test, most kids will pronounce that they’ve just tasted something “yucky.” Studies of preschool children have found that bitter tasters actually eat fewer vegetables and are less likely to classify bitter vegetables (such as broccoli) as “yummy” . 1. Be a good model. Eat and enjoy lots of veggies at the table with your child. Research has shown that parental modeling of healthy eating is strongly correlated to fruit and vegetable consumption of 2-year-olds . 2. Exposure, exposure, exposure. 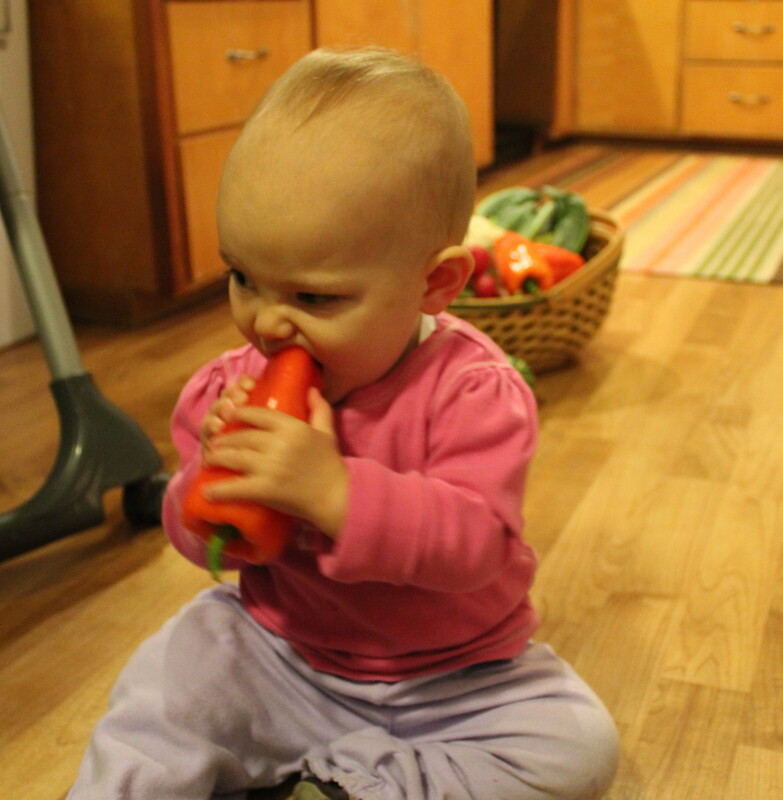 The only way for your toddler to override that innate aversion to bitterness is to repeatedly taste vegetables. As the taste slowly becomes familiar, your toddler becomes less skeptical. He might decide to even swallow just a tiny bit of broccoli one day, and when he doesn’t become sick from it (as would happen if he tasted a poisonous wild plant), he might eat a little more of it the next day. Multiple studies from 7-month-olds to older children have shown that repeated exposure to veggies does result in higher veggie intake (even 4 times more! ), but this can take 8 or more exposures [7, 8]. Most parents can’t take that kind of repeated rejection. They might offer broccoli 2-3 times and then give up, concluding “Billy doesn’t like broccoli” (words you should really try to avoid uttering – self-fulfilling prophecy and all). Consider it a good day if your toddler tastes a vegetable, even if he spits it back out, and offer more tomorrow or the next day. 3. Offer a variety of vegetables. 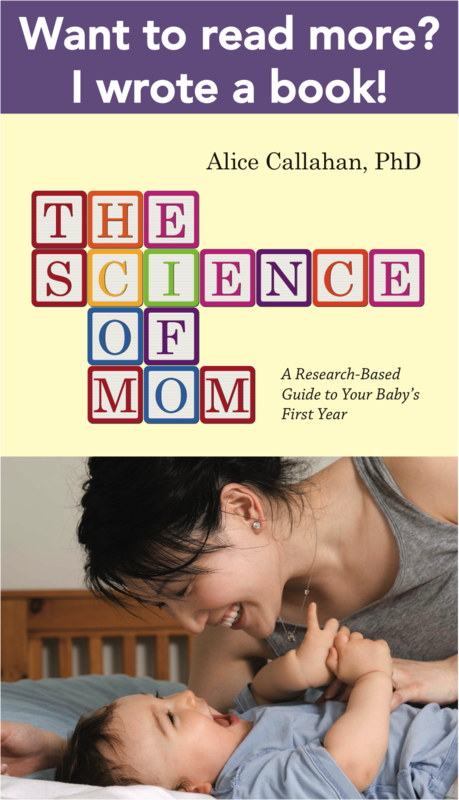 This has been studied specifically with young infants who are early in their exposure to solid foods (4-9 months). Several studies have found that offering different vegetables at different meals, as well as multiple vegetables in the same meal, for 9-12 days, increases veggie intake [9, 10]. The idea is to expose infants to lots of different tastes early on in their food experience. However, this has only been studied in the short-term. We don’t know if 2-year-olds that were offered a variety of vegetables at 9 months are still more adventurous eaters. But it can’t hurt to try. 4. Add flavor. Babies just starting out with solid foods don’t need salt or fat added to their veggies. They don’t know what they are missing and most will happily eat plain steamed vegetables. However, if you feel like your older baby’s list of acceptable veggies is getting smaller and smaller, consider livening things up a bit. Your ultimate goal is to transition your baby to eating the same foods as the rest of the family, and most of us enjoy our veggies with other flavors. Salt can suppress the perception of bitterness, so try adding a little to vegetables that are challenging for your child. One study found that adding a little salt to green beans increased their consumption in 2- to 3-year-olds . Also consider roasting vegetables with a little salt and olive oil, since roasting will bring out sweetness. Cook veggies in chicken broth to infuse them with flavor. Melt a little cheese on broccoli. At this point, I think it is more important to encourage your child to try vegetables than to keep them in their purest form. Just be aware that you do run the risk of conditioning your child to always need salt with his green beans. One study  assigned 4- to 5-year-old kids to taste plain, sweet, or salty tofu 15 times over the course of 9 weeks. At the end of this experiment, the kids preferred whatever type of tofu they had been exposed to – that is, the kids that had eaten salty tofu for 9 weeks liked salty tofu better than plain or sweet tofu. The good news is that when the researchers asked the same kids to taste-test plain, salty, or sweet ricotta cheese (which looked a lot like the tofu), the kids’ tofu preference didn’t carry over to ricotta. So if your child becomes conditioned to only eat green beans with salt, that doesn’t mean he’ll need salt with his broccoli, too. Take home message: use salt (and other flavor enhancers), but use it sparingly and strategically. 5. Sneak them in. In one study , 3- to 5-year-olds were offered entrées (including zucchini bread, pasta and sauce, and chicken noodle casserole) with several different levels of pureed vegetables covertly incorporated. The kids ate the same weight of the entrées regardless of vegetable content, and they even ate the same amount of other vegetable sides! Jamie Oliver’s Best Tomato Sauce Ever includes onions, leeks, celery, bell peppers, zucchini, and carrots, and one portion contains 2-3 servings of veggies! Spinach lasagna is a classic and a comfort food. Bake carrots and zucchini into muffins. Grate veggies and work them into meatballs. Get covert and creative with your cooking and then relax at mealtime. Now that you have lots of ideas about adding vegetables to your toddler’s diet, let’s talk about what doesn’t work. Pressure and manipulation don’t work. One-year-olds who were pressured by their mothers to eat fruits and vegetables ended up eating less of both by the time they were 2 . Even rewards don’t work. In a study of 5- to 7-year-olds, offering a cool sticker as a reward for trying vegetables did not help those kids to like or eat more vegetables . If you take nothing else away from this article, please remember this: you can’t make your child eat anything, and you shouldn’t try. Saying things like, “Just try one bite for Mommy” or “Santa will bring you more presents if he sees you eating your green beans,” will only make your child more skeptical of vegetables and begin a power struggle that you won’t win. Instead, act like you don’t care if your child eats vegetables. Continue to eat a variety of veggies yourself and offer them to your child with yummy accompaniments, and be patient. That is really all you can do. Your kid might grow out of his veggie aversion or he might not. Either way, he’ll be just fine. Do you worry that your child doesn’t eat enough vegetables? 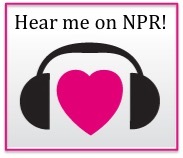 What has worked for you to increase veggie “likeability”? Siega-Riz, A.M., D.M. Deming, K.C. Reidy, M.K. Fox, E. Condon, and R.R. Briefel. Food consumption patterns of infants and toddlers: where are we now? J Am Diet Assoc. 110(12 Suppl): p. S38-51. 2010. Krebs-Smith, S.M., P.M. Guenther, A.F. Subar, S.I. Kirkpatrick, and K.W. Dodd. Americans do not meet federal dietary recommendations. J Nutr. 140(10): p. 1832-8. 2010. Bell, K.I. and B.J. Tepper. Short-term vegetable intake by young children classified by 6-n-propylthoiuracil bitter-taste phenotype. Am J Clin Nutr. 84(1): p. 245-51. 2006. Lumeng, J.C., T.M. Cardinal, J.R. Sitto, and S. Kannan. Ability to taste 6-n-propylthiouracil and BMI in low-income preschool-aged children. Obesity (Silver Spring). 16(7): p. 1522-8. 2008. Nicklaus, S., V. Boggio, C. Chabanet, and S. Issanchou. A prospective study of food preferences in childhood. Food Quality and Preference. 15: p. 805-818. 2004. Gregory, J.E., S.J. Paxton, and A.M. Brozovic. Maternal feeding practices predict fruit and vegetable consumption in young children. Results of a 12-month longitudinal study. Appetite. 57(1): p. 167-72. 2011. Sullivan, S.A. and L.L. Birch. Infant dietary experience and acceptance of solid foods. Pediatrics. 93(2): p. 271-7. 1994. Maier, A.S., C. Chabanet, B. Schaal, S. Issanchou, and P.D. Leathwood. Effects of repeated exposure on acceptance of initially disliked vegetables in 7-month-old infants. . Food Quality and Preference. 18: p. 1023-1032. 2007. Mennella, J.A., S. Nicklaus, A.L. Jagolino, and L.M. Yourshaw. Variety is the spice of life: strategies for promoting fruit and vegetable acceptance during infancy. Physiol Behav. 94(1): p. 29-38. 2008. Maier, A.S., C. Chabanet, B. Schaal, P.D. Leathwood, and S.N. Issanchou. Breastfeeding and experience with variety early in weaning increase infants’ acceptance of new foods for up to two months. Clin Nutr. 27(6): p. 849-57. 2008. Bouhlal, S., S. Issanchou, and S. Nicklaus. The impact of salt, fat and sugar levels on toddler food intake. Br J Nutr. 105(4): p. 645-53. 2011. Sullivan, S.A. and L.L. Birch. Pass the Sugar, Pass the Salt: Experience Dictates Preference. Developmental Psychology. 26(4): p. 546-551. 1990. Spill, M.K., L.L. Birch, L.S. Roe, and B.J. Rolls. Hiding vegetables to reduce energy density: an effective strategy to increase children’s vegetable intake and reduce energy intake. Am J Clin Nutr. 94(3): p. 735-41. 2011. Wardle, J., M.L. Herrera, L. Cooke, and E.L. Gibson. Modifying children’s food preferences: the effects of exposure and reward on acceptance of an unfamiliar vegetable. Eur J Clin Nutr. 57(2): p. 341-8. 2003. With my oldest child… pretty much nothing works. But she comes by that naturally, since I didn’t really eat veggies until college, and my Dad doesn’t much like them, and his Mom doesn’t much like them… so yeah, we have genes that make them taste yucky. My mom and my sister do not have this problem, and love veggies. I’ve tried explaining what green veggies taste like to me, and fail miserably. All I can say is- they taste bad! I have to hide the taste to eat them, except for spinach and arugula, which don’t bother me for some reason. I hide the taste with cheese, stir fry sauces, bacon, and the like. I do have one recipe for green beans with orange juice that works for me, too. Anyway, the only vegetable like substances that our 4.5 year old will eat are baked sweet potato fries and pumpkin scones. But since I know our family history (and my grandma, by the way, is going strong at 90 years old)- I don’t worry about it. We keep modeling eating veggies and giving her the chance to try if she wants. My 2 year old will eat both things her sister eats, but also likes tomato sauce, my carrot risotto, and my carrot cake pancakes. We keep offering her green veggies, too, but she refuses- but she apparently will eat peas at day care. So there is some hope for her. Her sister never ate her veggies anywhere! I meant to add (although my post, as usual, got way to long anyway) that in all of these studies on repeated exposure, there are always some non-responders – kids that flat-out refuse to even taste the veggies during the experiment. Or taste a little but don’t increase their liking of the veggie with exposure. And for repeated exposures to work, they do actually have to taste the food. Just visual exposure doesn’t work – its been tested. Your oldest might have been among those kids. I always like to imagine some grad student struggling with the data analysis when I read these studies, cursing the outlier who messes with tidy results! Thanks for all the recipes! I think your statement “carefully, quietly and patiently” sums it up best. Children are in control of their own bodies, we can’t force them to eat. Serve the food your family eats, and then don’t mention it. They will eat…eventually. Important to keep in mind not to fall into the trap of serving different meals. Keep it the same, simple and then sit back and eat. Great point on not falling into the trap of serving different meals. I have to admit that I struggle with this one, even though it seems so simple and I completely agree in principle. As a first-time parent of a now 13-month-old, I think I’m having trouble with the baby to toddler transition. I thought of one of my primary roles as a parent of a baby being meeting her need for calories. Now when she refuses to eat what I put on her high chair tray (or chucks it off the side), I have a hard time not jumping up and getting her something that I know she will eat. I always keep it healthy – whole wheat toast with peanut butter has become a go-to – but I don’t want to fall into the trap of always fixing her a separate meal. And I know she won’t go hungry, but it is still hard for me. My latest compromise is to start the meal with something (healthy) that she usually eats readily and then add in the foods that might reject. That way I feel satisfied that she has at least eaten something, but she doesn’t see me leaving the table to get something new for her when she rejects dinner. I think this is an excellent article. I would like to add a few points. First, it always surprises me that most parents will excuse marginal foods because they contain some nutrients (sweetened yogurt comes to mind) but they wouldn’t dare “sully” healthy foods (i.e. vegetables) by adding “unhealthy” flavor (butter, salt, etc.). This seems like a self-defeating strategy. “Sullied” vegetables are better than pseudo healthy or beefed up (i.e. stuff with added nutrients) like crackers, puffs and other stuff we regularly feed our kids. And if the food doesn’t taste good (or doesn’t taste as good as competing foods) kids won’t eat it. Period. Also, remember that tasting is not the same as eating. In all those research studies where they expose kids to new flavors over and over they aren’t asking the kids to eat the foods. No, they are asked to take a tiny taste. Then they’re asked to rate. It’s a doable challenge. Finally, there are lots of hidden ways we inadvertently teach kids that vegetables are necessary but bad, and that unhealthy stuff is bad but “good.” I could go on and on about creating the right environment for vegetable consumption, but I won’t. Dina – Thanks for reading and your great comments. Your point about marginal foods vs. “dressed up” whole foods is really interesting. I think many of the marginal foods are introduced because we think they’ll be good snacks to get through errands or a long car trip. WE know they aren’t the healthiest, but they are quickly adopted by the toddler. Meanwhile, at home we keep trying to make healthy meals. Speaking as a first-time parent, I also started off thinking that I should keep the vegetables “unsullied,” and it took me a while to realize that my daughter really enjoyed more flavor in her food, just as I do. Also, excellent point about the exposure studies being about tasting and not eating. The outcomes measured are usually amount eaten in a final test and their “likeability” rating. Most of these studies took place in school or childcare settings, where the taste test would be a novel sort of activity. The child’s acceptance and eating of the same foods in a home environment might be different. I could never get BabyC to eat purees! They are all different, aren’t they? And yet, what kid doesn’t like Cheerios? Something I’ve heard again and again (and there may be scientific evidence to support it, but I haven’t bothered to look) is that gardening with your child increases their willingness to eat the things they’ve grown. It makes good sense. We live in the city with a tiny backyard, but we turned part of it into an approximately 10 by 10 garden plot, and we’ll involve W in the garden as soon as she can walk; even a toddler can carry a water can (the garden is on drip irrigation, but she doesn’t know that!) and pluck veggies off the vine! For those without the option to grow veggies at home, many cities have nearby u-pick farms, and if even THAT isn’t an option, one might try taking the little one to a farmers’ market and letting the toddler/child help pick veggies and fruits for that week. Yes I agree, my son is just over 2.5yrs and ‘helps’ tending to the vegie garden and readily eats a wide variety of vegies and herbs (tomatoes, zucchini, spinach, celery, parsely, basil, mint)….On occasions that he does not want to eat something I drop the line ‘but we grew that in our garden…….’ and he will usually gobble up the item – even if it has been store bought! Great article–an interesting question to me, thought I’m not dealing with how to get kids to eat veggies, it’s something I worry about with my adult customers, as a cook! It’s not just a problem with kids: how do we get adults (and ourselves) to eat more veggies, or even “real food” in general? But I wanted to add one little note: you mention that roasting increases sweetness–while this is true, what roasting also produces is Maillard reactions, which is a lot like caramelization, only with amino acids rather than sugar, producing hundreds if not thousands of taste compounds, among them the compounds responsible for the flavor _umami,_ (best english translation: savory). Grappling with the problem of how to serve people real food, I’ve come to observe that while producing various Maillard reactions is more or less central to “real” food traditions, processed food does not seem to be made in such a way as to release these sorts of flavors, and that adults who are familiar with a primarily processed-food diet seem inclined to avoid cooking techniques that maximize such flavors (they will steam food, rather than roast it, or microwave rather than sautee). It seems a very similar problem to that of teaching kids (and adults) to like vegetables, but to my mind it seems like a problem closer to the heart of the issue: how do we teach kids (and adults) to like real, not-processed foods? And might they be related, these problems? Could it be that we don’t like veggies because we don’t like cooking? Teo, thanks so much for your comment. I appreciate your explanation of Maillard reactions. I considered expanding on my statement about roasting foods but the post was getting rather long, so I’m grateful that you brought it up in the comments. I myself am a big fan of the flavors that result from Maillard reactions. It is interesting that parents making their own baby food are almost always instructed to simply steam veggies and puree them. I LOVE the flavors in roasted veggies, and I can’t imagine a baby would object to these flavors, even in the first foods she tastes. The simplest answer to your problem of teaching adults to like real foods is to start feeding our babies real foods in the very first bite and minimizing their exposure to processed foods during the first few years of life. It becomes a real challenge to shift taste preferences later in life, although it can be done. Adults at least choose to eat the foods they do for many reasons. They can learn to value things like local, fresh, and healthy, in addition to taste. Young kids only eat things they like the taste of, so introducing them to new foods means balancing innate preferences and optimizing the presentation of new foods by adding flavors that they like. Anyway, you might be interested in knowing that there is a there is a movement away from white rice cereal as the first food for babies. I’m researching the topic now to see if there is scientific evidence that starting babies on this refined starch might impact their later food preferences and/or propensity for obesity or metabolic problems down the road. Nice article–you summed up the research nicely. I find it’s always comforting for parents to know that fruit provides most of the same nutrients as vegetables–it helps them relax the pressure on feeding veggies. The other comforting piece of information is that kid’s taste buds change over time to be more accepting of foreign foods, and by late childhood/early teens, most kids become quite open to vegetables and other foods. Take away message: just keep offering vegetables as part of a well-balanced meal (and lose the emotional investment around whether or not your child eats them). I’m interested in doing a direct nutritional comparison of fruits and veggies that are commonly eaten by toddlers to see how the numbers look. One of my readers asked me about this a while ago, and I think this would make an interesting post. And yes – tastes do change over time! The same study I cited above showing that people that like veggies as kids grow up to like them as adults also showed a general shift towards greater “likeability” of veggies with age, which is reassuring. I never had this struggle with child no. 1. I don’t know why but he will still choose veggies over meat. Child no. 2 is 8 months old and I can tell already that he is God’s gift to me to tell me that I don’t know anything about ‘anything’ because he still won’t eat anything ‘mushy’, or off a utensil (just starting to) only chunks stuffed into his mouth with my fingers and most food is pushed out by sticking his tongue out and moving it around unti it is all OUT! In the end, I have found chunks of avocado work for them both somehow and the parenting experiment continues. My daughter was the same way – no purees and no spoons. We pretty much went straight to finger foods. I actually liked this arrangement better once I accepted that it was silly to try to feed her purees. It was easy to make soft chunks of cooked fruits and veggies and things like beans, tofu, and tender meats, and she seemed to appreciate being able to control what went into her mouth and at what speed. Avocado is a great choice, having a nice calorie content and healthy fats. So useful. My daughter used to eat any/everything we gave her- including veggies. However, around a year, that stopped. She’s great with fruits, but not with veggies. We keep giving her a portion of veggies with her meal, despite her protestations, hoping one day it will click and she’ll go back to eating them. Hiding them has been my most successful tactic. I’ll make a risotto with lots of chopped veggies (especially spinach) and that seems to work. This is my recipe (http://mommacommaphd.wordpress.com/2011/07/09/spinach-risotto/). Tomato sauce is also a favorite of hers, so I’ll try the recipe you linked to! However, she’s just as averse to meat as she is to veggies- so I have to sneak in protein too! I don’t know where we’d be without dairy and peanut butter! Thanks for the recipe! Risottos are a great kid-friendly food. I made one recently with butternut squash and kale, and BabyC ate it right up. The trick is to cut up the greens in small enough pieces that they are hard to sort out. I haven’t tried the Jamie Oliver sauce recipe, but it looks delicious. I do admit that I wonder about our covert foods tactics. I’m always uncomfortable feeling like I’m trying to “trick” BabyC into doing anything. I try to always tell BabyC what is in her food and talk about how delicious it is. I guess I just don’t want her to grow up thinking that she doesn’t like vegetables even if she readily ate them when they were hidden in her food. I may change my tune on this when she gets older, though. I can imagine some kids might hear that the risotto has spinach in it and just refuse to try it on principle. Maybe then the thing to do is serve it quietly but mention at the end of the meal how good the spinach risotto was? How do you have the time to put together such well-informed posts!? Totally awesome. With our 2.5 year old, we added FLAVOR THROUGH SPICE: cinnamon, cumin, chili pepper, paprika–you name it! I started doing it one day after I wondered why I couldn’t add spice to my baby purees. I think I’d just blocked out the idea because Gerber doesn’t do that. Oh, conditioning! He still eats all kinds of spicy things, which rocks. I love the gardening tip. Now that K-Pants is older, he “helps” cook also. He’ll eat more things that he helps prepare. We’re eating a lot of kale, so thanks for the recipe for the kale chips in the comments! great article – our nearly three year old was fab with veges until she turned about 18 months and then her taste buds really changed. We have found eating with her has really helped and in summer have offered her more salad with tomato, cucumber, carrot, avocado, capsicum etc and she loves this! I think our one just prefers them raw. Home made coleslaw has been a good one too…! Our daughter has a total dislike of potato too, unless of course they are chips! Such a great post! My son is 14 months and has such an aversion to veggies. He has been EBF so getting him to eat solids in general has been challenging, but he loves fruits and grains. I am studying to be a nutritionist so it has been really stressing me out. Thankfully I stumbled across this post because you offered some really great and reassuring tips!